A great old fashioned Christmas candy makes the season extra special. We all have old family favorites, or recipes that our grandma used to make. There are always certain tastes or smells that remind us of visits to Grandma's house. That nostalgic feeling is part of the joy of the holiday season to me. What makes you close your eyes and remember years gone bye and childhood experiences? I'd love to have a copy of your traditional Christmas treats, so please do share them with us. If you're looking for something new, try this recipe for chocolate billionaires and make everyone in your own family smile and get that dreamy look on their face. In fact, if you make this chocolate billionaire recipe perhaps it will become one of those great memories that your children or grandchildren will come to treasure and pass on down to their own children one day. Combine caramels and water in the top of a double boiler. Melt at low heat, stirring gently until smooth. Remove from heat. Stir in chopped pecans and crushed cereal. Drop by spoonfuls onto lightly greased waxed paper and chill. Melt together the chocolate chips and the shortening. You can use a the double boiler again, but be sure that the bowl has been cleaned and completely dried. If any water gets in the chocolate, it will sieze. Alternatively, you can melt the chocolate in the microwave if you stir every 30 seconds and DON'T OVERHEAT. 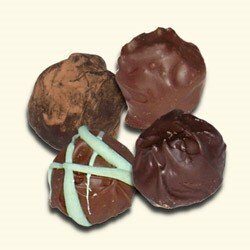 Dip chilled balls into the melted chocolate and place on waxed paper to set. They can be chilled again if you want them to set more quickly, but you may end up with bloom (discoloration) if you aren't careful. Store your old fashioned Christmas candy in an airtight container (a cookie tin works well). Do you have any recipes for old fashioned Christmas candies that you can share with us? Please add them using the Christmas Candy form so we can all enjoy the pleasure.